Which country requires the most energy to heat it or cool it? It was interesting to review the separate interactive world maps in chartsbin.com for the heating and cooling requirements for climates of various countries. 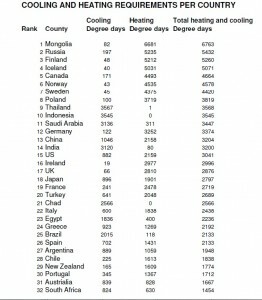 The requirements of the various countries climates were measured as the number of degree days above or below 18 degree Celsius. Click here to see the heating chart and here to see the cooling chart. As you may have guessed countries located in extreme Northern latitudes dominate for having climates that require most heating to achieve comfortable temperature levels. Whereas Countries located close to the equator have climates which require the most cooling to achieve comfortable temperature levels. 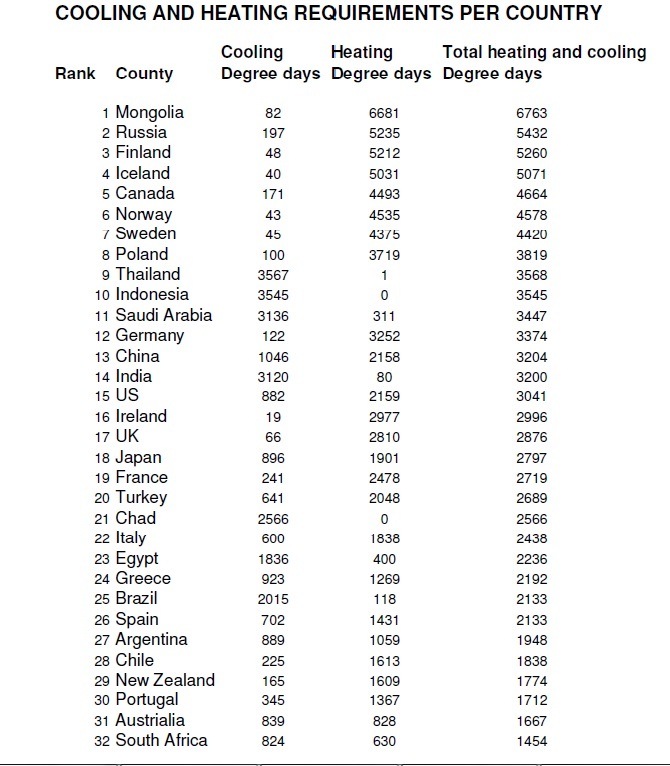 I thought it would be interesting to combine these heating and cooling figures together, so that it would be possible to compare countries for their total energy requirements to achieve comfortable temperatures all year round. I selected 32 Countries from around the world , while including the extreme cases, and the results are listed below. Ireland has the least need of cooling or air conditioning in the whole world, with only 19 degree days required, compared with 40 in Iceland and 43 in Norway. Obliviously if the Arctic and Antarctic were considered countries they would knock Ireland off this position. No information is available for Greenland, possibly as it is lightly settled and a territory of Denmark. Interestingly the top seven countries with the most energy needy climates are the same as the top seven countries that require heating. But the warm countries of Thailand, Indonesia and Saudi Arabia make up the 8th, 9th and 10th positions of the total energy needs. The figures for China, USA, Australia and Chile are averages and should be treated with caution as the climate of these countries obviously varies a huge amount depending on location. Many Countries require no heating; these are located along the equator and include central African countries, Oman, Yemen, and Cambodia to name a few. Based on my selected countries than it would seem that Mongolia has the worst climate based on the energy requirements to maintain a comfortable temperature while South Africa has the best climate. Australia has the most balanced climate with the days requiring heating and cooling almost the same, but again this is an average for a large country.